One of the great delights of working at The Library of Congress is being able to attend all manner of lectures on marvelously obscure subjects. Yesterday's fascinating jaunt through the cultural history of the piano accordion by musicologist Marion Jacobson was no exception. Jacobson, who plays the accordion herself, has just published a book on the subject entitled Squeeze This: A Cultural History of the Accordion in America. I learned a great deal not only about the instrument over the course of an hour but also, more surprisingly, about American cultural history as a whole. What intrigued me most was Jacobson's case for the accordion as representing the "high brow-low brow" tension that symbolizes a lot of American culture. Named from the Italian word "accordare," meaning "to sound together," the accordion's flexibility as an instrument enables it to play a vast range of types of music, from works from the classical music cannon to circus music. It's a more sociable, low-cost piano, a portable one-man-band. For a while, it was taken pretty seriously as an instrument: Apparently NBC used to have a staff accordionist -- Charles Magnante. There were entire accordion orchestras and accordion virtuosi were accorded rockstar status. Composers wrote concerto for accordion. High street studios opened up across the country for teaching the instrument. And in post-war America, sales of the piano accordion outpaced that of all other band instruments combined. "The piano accordion was a tool of upward mobility," Jacobson said. 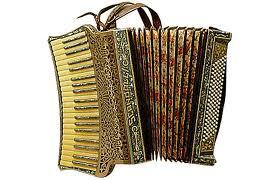 Q: What do a lawsuit and an accordion have in common? A: Everybody is happy when the case is closed. Q: What’s the difference between an onion and accordion? A: No one cries when you chop up an accordion. Accordion teachers apparently saw rock music as a passing fad and refused to teach students how to adapt the instrument to suit a rock sensibility. One instrument maker tried to introduce a version of the accordion called a "rockordion" but it didn't take off. It had fewer switches and reeds and a smaller range than a typical piano accordion, so seasoned accordionists didn't take it seriously. For a time, the pop music industry was marked by celebrities who once played the accordion but stopped, like Connie Francis and Bill Haley. Others, notably John Lennon, still played. “But not publicly,” as Jacobson curtly put it. Now, of course, the accordion is hip once again. In the Bay Area, which seems to be something of a hotbed for the accordion renaissance, the instrument has become synonymous with the artistic underground, especially the so-called "New Burlesque Movement". I personally am done with seeing groups of scantily clad twenty- and thirty-something girlies with accordions strapped to their corsets regaling audiences with "Lady of Spain" while dangling provocatively from low-slung trapezes. We get way too much of this kind of thing in the Bay Area. What I'd like to witness is more high quality zydeco and Cajun music in my neighborhood. Oh, and it would be fantastic to experience the San Francisco Symphony doing an accordion concerto at Davies Symphony Hall.